Kernicterus (Bilirubin encephalopathy) is an acquired metabolic encephalopathy of the neonatal period. Its etiology and pathogenesis overlap to some extent with HIE. Kernicterus is caused by unconjugated hyperbilirubinemia that develops either as a result of hemolytic disease (Rh incompatibility, hereditary spherocytosis, other hemolytic disorders) or because of inability of the liver to conjugate bilirubin. The latter is seen in a rare defect of glucuronyl transferase, the Crigler-Najjar syndrome, and in premature babies in whom this enzyme is not fully functional. Unconjugated (indirect) bilirubin in serum is bound to albumin. Unbound, unconjugated, circulating bilirubin crosses the blood-brain barrier and, because it is lipid soluble, it penetrates neuronal and glial membranes. Hypoalbuminemia, low pH, which weakens the albumin-bilirubin bond, and drugs (salicylates, sulfonamides) that compete with bilirubin for albumin binding, increase the amount of unconjugated unbound bilirubin. Prematurity and low birth weight are the greatest risk factors for bilirubin-induced brain injury. Kernicterus. Bilirubin staining of the thalamus and basal ganglia. Bilirubin has a special affinity for the globus pallidus, the hippocampus, and the subthalamic nucleus. Many other structures, including the striatum, thalamus, cranial nerve nuclei, inferior olives and dentate nuclei of the cerebellum are less frequently affected. In the hippocampus, kernicterus involves the CA2-CA3 sectors of the pyramidal layer, unlike HIE, which affects CA1. The reason for the topography of the lesions are not known. 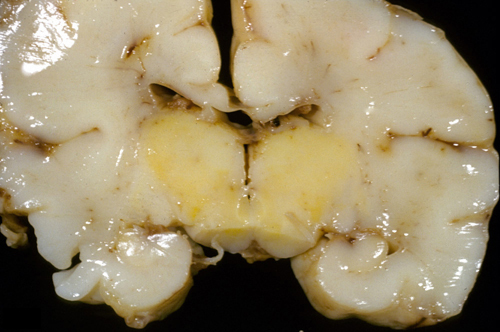 In severe kernicterus, affected structures have a bright yellow color (kernicterus means nuclear jaundice). Microscopically, they show neuronal necrosis (eosinophilic neurons similar to HIE) and, in burned-out cases, neuronal loss, gliosis and atrophy. Bilirubin binds to cell membranes and is toxic to neurons and oligodendroglia. It damages mitochondria, inhibits oxidative phosphorylation, and causes calcium release promoting apoptosis. It also stunts axonal and dendritic growth. The acute toxic injury is aggravated by inflammatory reactions of microglia and astrocytes. Immaturity of the blood-brain barrier probably plays a role in kernicterus. Infusion of bilirubin in experimental animals, after "opening" of the barrier by injecting hypertonic solutions, causes bilirubin staining. Bilirubin encephalopathy affects parts of the brain that are also involved in perinatal HIE. According to one school of thought, kernicterus is simply due to leakage of bilirubin in areas where the blood-brain barrier has been damaged by HIE. Babies with bilirubin encephalopathy are lethargic, hypotonic or hypertonic, and have a high pitched cry, opisthotonus, seizures, and may die if bilirubin is not lowered. 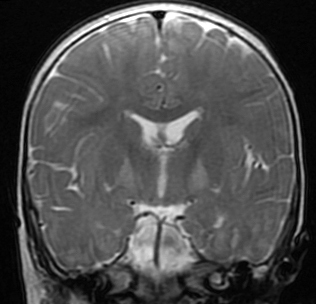 The MRI shows high T2 signal in the globus pallidus. Patients surviving kernicterus have severe permanent neurologic symptoms (choreoathetosis, spasticity, hearing loss, ataxia, mental retardation). Less severe injury is associated with mild neurological abnormalities, including hearing loss, which may be the only abnormality. Kernicterus as a result of Rh incompatibility is now rare. Rh isoimmunization can be prevented if an Rh negative mother is given an intramuscular injection of anti Rho(D) immune globulin within 72 hours of the birth of an Rh positive baby or in any situation in which significant fetal maternal hemorrhage may have occurred. The systematic use of phototherapy in the NICU reduces bilirubin by breaking it down to water soluble derivatives. The level of bilirubin required to cause kernicterus varies widely, even among mature infants, depending on other risk factors. Some cases of kernicterus are seen in premature babies with relatively modest levels of bilirubin. These babies often also have GMH-IVH and PVL.